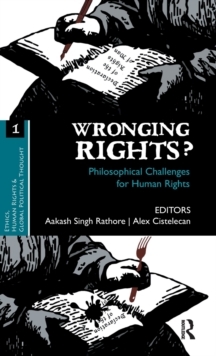 This book brings together two of the most powerful and relevant philosophical critiques of human rights: the post-colonialist and the post-Althusserian, its balanced internal structure not just throwing these two critiques together, but actually forcing them to enter into confrontation and dialogue. The book is organised in three parts: at each end, the post-colonialist and the post-Althusserian critiques are represented by some of their main thinkers (Ratna Kapur, G.
C. Spivak, Upendra Baxi; Slavoj Zizek, Jacques Ranciere), while in the middle, an American intermezzo (Richard Rorty, Wendy Brown) functions as a genuine Derridian supplement: always already contaminating the purity of the two theoretical schools, preventing their enclosure and, hence, fuelling and complicating further their mutual confrontation. As in any authentic dialogue, the introduction and the conclusion each claim victory for one of the sides by changing the very terms and rules of the dialogue, picturing it as a confrontation between emancipatory universalism and inefficient particularism (from the perspective of the post-Althusserians), or as a split between hypocrisy and truth (from the perspective of the post-colonialists).